I don’t have a set recipe for these kale chips mainly because every bunch of kale differs in size. I really don’t think you need an exact science when it comes to making thee. Everything is more or less “to taste” and once you’ve made a few batches you’ll really get the gist of it and will know how much of each ingredient you enjoy. 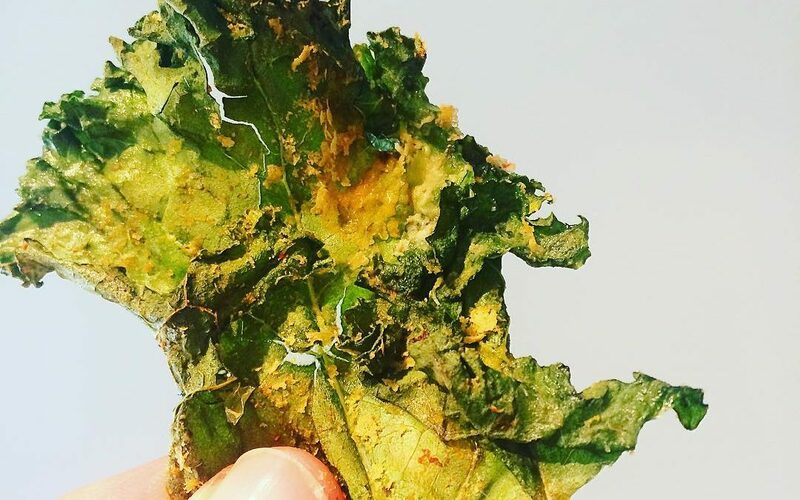 Wash and de-stalk kale then dry the best you can. I use a lettuce spinner and then I dry them with paper towel. Once completely dry place in a bowl and add oil of choice, garlic powder and lemon juice. Massage into all the leaves to coat evenly. Lay the leaves out on a baking sheet. Don’t overlap them too much (that’s important in order to get crispy chips). Then sprinkle them liberally in nutritional yeast, turn over and coat the other side. Bake for approximately 10 – 14 minutes (but keep an eye on them so they don’t burn). Sometimes I like to use tongs to toss them a bit to make sure each leaf gets exposed to the heat in order to crisp up.